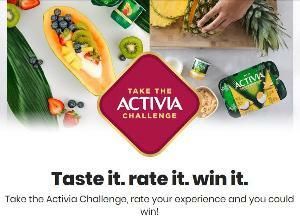 Prize: 15 winners - Each winner will receive a month’s worth of Activia® in the form of 8 coupons valued at $64 CAD, which can be applied to the sizes and flavors of their choice. What you must do to enter: review the flavor of your choice. Statistics: This contest was opened by 86 and entered by 2 ContestChest.com members. 2% of those who opened the contest, entered it.